Three posts in one week! It’s a miracle! After being away from this blog during our whirlwind spring of weddings and travel it is soooo good to be back. I hope I’m not boring you too much with the Whole 30 thing. I promise not to talk about it allllll the time. Really, I’m just making good, clean food here. You can label it whatever you want or don’t label it at all. Just make it, enjoy it, and feel good. That’s all anyone can ask for, right? 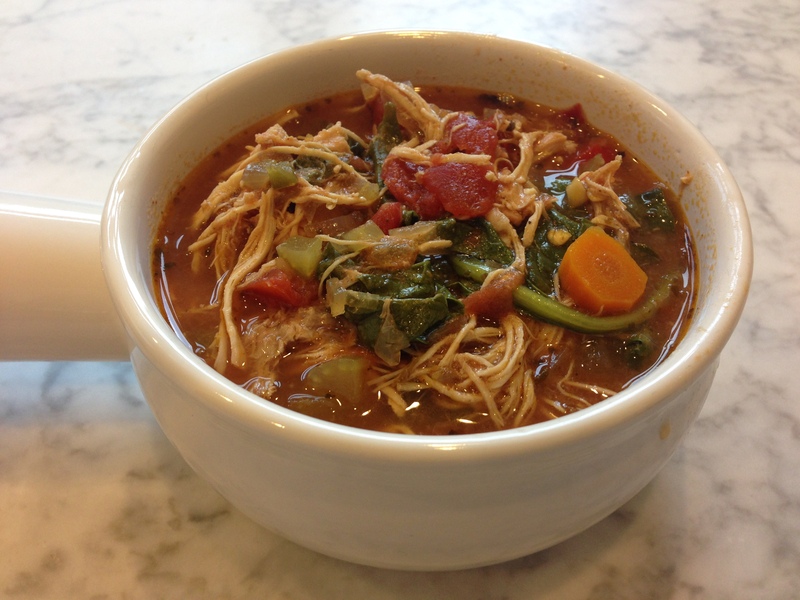 This week I had a mega hankering for my favorite slow cooker chicken tortilla soup. It was a little chillier here in Chicago (though still nice) so I knew it would be great for lunches. I’m happy to say it did not disappoint. I updated my favorite slow cooker chicken tortilla soup recipe by ditching the beans and corn and packing in even more veggies than before. The result was stellar. It has all of the same kick and flavors as my beloved recipe with an even greater nutritional bonus. That’s what I call a win-win. Place the chicken breasts, tomatoes, and chicken broth in the slow cooker. In a microwave-safe glass bowl add the carrots, celery, red bell pepper, onion, jalapeño, garlic, olive oil, cumin, chili powder, and oregano. Mix to coat everything evenly in oil and spices. Microwave on high for 2 minutes. Stir. Microwave for 2 more minutes. Stir. If veggies aren’t softened, microwave 1-2 more minutes. Dump the veggies into the slow cooker. Cover the slow cooker and cook on low for 8 hours. When it’s done cooking, remove chicken breasts to a cutting board and shred with two forks. Return chicken to slow cooker. Mix in salsa and spinach. Continue cooking on low for 15 to 30 minutes more. Right before serving, squeeze juice of one lime. 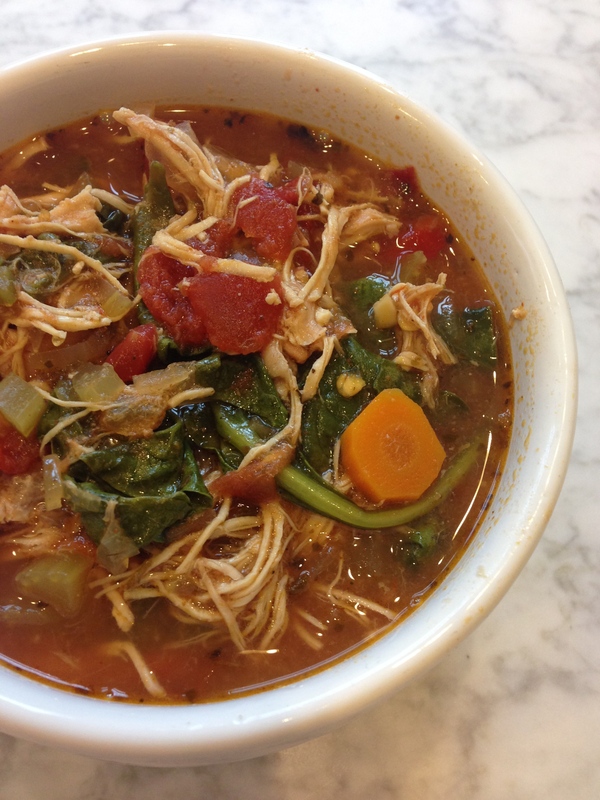 This entry was posted in Chicken, Slow Cooker, Soup, Whole30 on July 17, 2014 by Paige Greenfield.